Image showing the provisional names being used by the New Horizons team for features on Pluto’s largest moon, Charon. These monikers have not yet been approved by the International Astronomical Union (IAU). The "Star Trek" and "Star Wars" universes are coming together on Pluto's big moon Charon. The team behind NASA's New Horizons spacecraft, which performed the first-ever Pluto flyby last month, has unofficially named some Charon craters after characters from both beloved sci-fi franchises. New Horizons' flyby revealed both Pluto and Charon to be complex worlds with diverse surfaces, so there are a lot of new features to name. 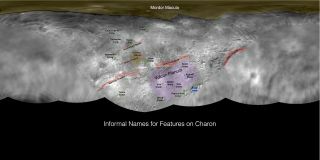 Most of the newly announced Charon monikers are drawn from the science fiction canon; famed sci-fi authors Arthur C. Clarke and Octavia Butler get their own craters, for instance, and chasms on the 750-mile-wide (1,200 kilometers) moon are named after fictional spaceships, such as Nostromo from the 1979 film "Alien." Image showing the informal names being used by the New Horizons team for features on Pluto. These monikers have not yet been approved by the International Astronomical Union (IAU). The Pluto appellations, by contrast, are generally more grounded in reality, featuring real-life explorers (though two large, dark features on the dwarf planet are named after the Balrog, a type of monster in J.R.R. Tolkien's fantasy novels, and Cthulhu, a god created by writer H.P. Lovecraft, respectively). Image showing the informal names being used by the New Horizons team for features on the icy Pluto plains known as Sputnik Planum. These monikers have not yet been approved by the International Astronomical Union (IAU). For instance, Pluto's famous "heart" is named after Clyde Tombaugh, the American astronomer who discovered the dwarf planet in 1930. Other parts of Pluto are named after pioneering space missions, including NASA's Viking, Pioneer and Voyager efforts; the Soviet Union's Venus-studying Venera program; and Hayabusa, a Japanese mission that returned pieces of an asteroid to Earth in 2010. The large, icy plain within Tombaugh Regio ("Tombaugh Region") is called Sputnik Planum, after the famous Soviet satellite whose 1957 launch marked the birth of the space age. Other parts of the heart are named after the space shuttles Challenger and Columbia, which were lost in 1986 and 2003, respectively, resulting in the death of 14 astronauts. The New Horizons team is not just recognizing space exploration, either. Famed French oceanographer Jacques Cousteau's name now graces a Pluto cliff, and the dwarf planet's two known mountain ranges are named after Edmund Hillary and Tenzing Norgay, who, in 1953, became the first people ever to summit Mount Everest, Earth's tallest mountain. The New Horizons team selected all of these monikers with help from the public — specifically, the "Our Pluto" campaign, a joint project involving NASA, the International Astronomical Union (IAU) and the SETI (Search for Extraterrestrial Intelligence) Institute in Mountain View, California. People around the world suggested tens of thousands of names via the Our Pluto project during its March-April run, New Horizons team members have said. The names of Pluto's surface features are divided into six themes: space missions and spacecraft, scientists and engineers, historic explorers, underworld beings, underworlds and underworld locales, and travelers to the underworld. Charon's craters, mountains and canyons are being named according to four themes: fictional explorers and travelers; fictional origins and destinations; fictional vessels; and exploration authors, artists and directors. Each of the four small moons has one associated theme: deities of the night (Nix), legendary serpents and dragons (Hydra), dogs from history, literature and mythology (Kerberos) and river gods (Styx). The maps that host all of these names will continue to come together over the next year or so. It will likely take New Horizons about 15 more months to beam its complete set of flyby images and observations back to Earth, mission officials have said.